Final Frontier is a Canadian band that specializes in 1980's style power AOR / melodic hard rock. I first discovered the band with their second album, The Second Wave. Before doing any research on the band, I thought this was some lost CD from an obscure 80's band. Even the artwork for that album has a distinct 80's flavor. However, Final Frontier made their debut in 2003 with The First Wave. Freelight is their fourth album, and all I can say is that the guys have quietly established themselves as simply an awesome power AOR / melodic hard rock band. The band was formed by Mladen of Von Groove and singer/songwriter Rob Moratti. From listening to all four albums in the band's discography, it is overwhelmingly apparent that Final Frontier have an amazing chemisty that enables them to deliver killer song after killer song. Guitarist Lawrence Falcomer of Sonic X and drummer Kevin Howley join Mladen and Moratti to round out the band's lineup. For those of you unfamiliar with Final Frontier (many of you, I suspect), keep reading if a blend of Survivor, Journey, heavier REO Speedwagon, and Styx might appeal to you. Final Frontier doesn't attempt to do anything new, nor do they try to reinvent what AOR / melodic hard rock is. Instead, the band sticks by a tried and true sound, and they perform it exceptionally well in the new millennium. One thing that might stick out to some listeners is Rob Moratti's distinct singing. He stays exclusively in the high registers, something will undoubtedly alienate some listeners. However, Rob doesn't stretch beyond his abilities to reach the high notes, nor does he sound thin and strained when he sings. Many power metal bands employ singers with a baritone voice and expect them to sound high. The end result is a thin and obnoxious sound. Rob's voice is at the very lowest a tenor, meaning that his voice is right at home in the high registers. As a result, his voice soars with thickness and power in the high ranges, not sounding strained or thin whatsoever. He also has a great sense of melody, and delivers a lot of passion with his voice, something that is integral to this style of music. Freelight sees the band add a harder edge to their sound. Although not much heavier than their previous efforts, the rhythm section is much more pronounced this time around, and the solos are more prominent. Also, the riffing is sharp, and more pronounced than on previous efforts. As a result of this, the pure AOR sound of the band has a bit more power and rockish quality to it. As with previous albums, the keyboards play a prominent role in the band's sound. The guitars are featured more on Freelight than on previous albums, but the keys are still used to accentuate melodies and add atmosphere to the sound. Final Frontier is one of those bands that have a knack for writing songs that jump into your memory after one listen. The band makes extensive use of layered and harmony vocals ala Styx that really help to drives the melodies home. There is certainly no shortage of catchy, 80's style anthems on this disc, and I must say that there is no filler material to be found. Even the ballad, I Hope You Don't Mind is a well done track, not too distant from Survivor in their heyday. As I've found with other Final Frontier discs, the album simply captivates you, and the album is over before you know it. At 56 minutes, this isn't a short album, but the end does sneak up on you. The songwriting on this album is simply fantastic. Once you give this album a listen, I think you will clearly understand that the chemistry within this band is very special, enabling the songwriting process to take place as naturally as a sunrise. 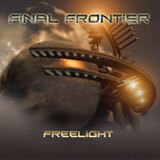 If you've ever been a fan of 80's AOR or melodic hard rock, there is little room for disappointment with Freelight. Without a doubt, Freelight is a big contender for AOR / hard rock album of 2006. With their fourth album now under their belt, it obvious that Final Frontier is a gifted band when it comes to writing and performing AOR / hard rock songs. There's not a bad album in their discography. Freelight is a great place to get acquainted with the band. However, if you enjoy any of the four Final Frontier albums, you can blindly buy the other three and rest assured that it is a worthwhile investment.